Where is your fish coming from and are you eating the fish you ordered? The shocking truth is about to be revealed and currently it’s all legal! Fish & Co proudly features in a new TV documentary series on SBS One, ‘What’s the Catch’ presented by The Gourmet Farmer, Matthew Evans. The media is already on board even before the launch which has also sparked a senate enquiry into seafood labelling laws with many good articles to read of which we will cover some of the main points here in this article. Along the way he confronts industry experts, restaurant giants and even our own politicians on the shocking truth behind our seafood. Making his way from the salmon farms in his home state to trawlers on Asian seas, he reveals the true price behind cheap prawns, salmon and flake — and you may want to stop reading now. “Not telling you what’s really in your dish is advantageous,” he told news.com.au. 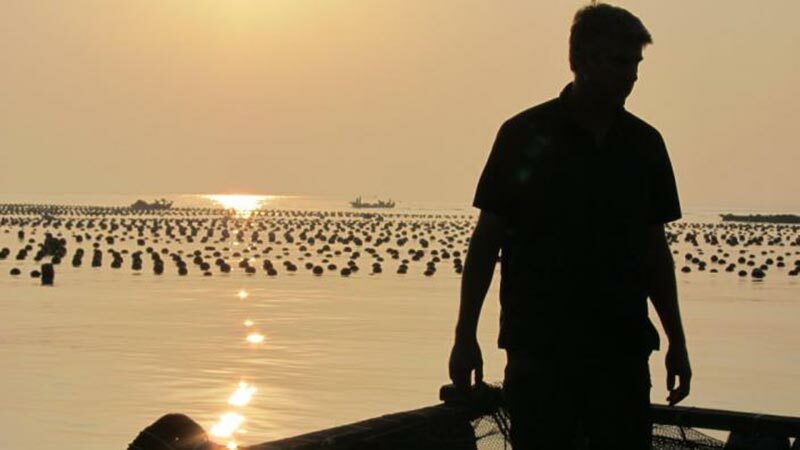 Evans, who visited a prawn farm in Thailand, as part of his three-part documentary, said if Aussies knew what really went into them they would be shocked. 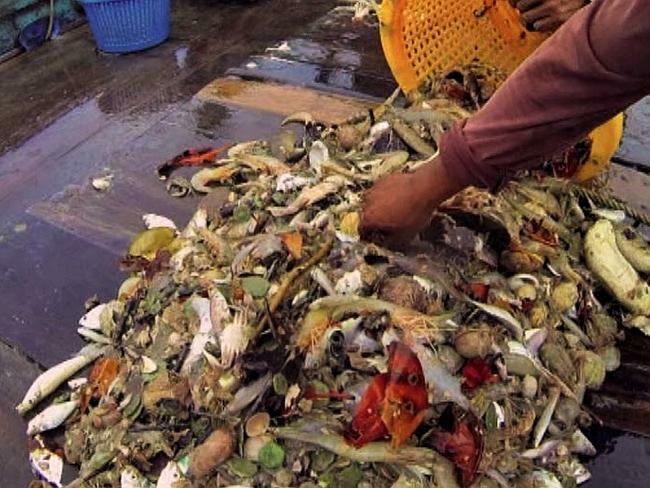 On-board a trawler in Thailand, he reveals what goes into the food the prawns are fed — and as these pictures show it’s not pretty. 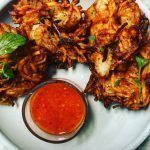 “If people knew for every kilo of Thai prawns they eat, it takes 4kg of sea trash which is ground up into pellets, it would make them think twice,” he said. He added not only were packaging laws misleading but consumers often thought they were getting an Australian product when they weren’t. He said fish labelling was often crude and deliberately deceptive, and has begun a truth in labelling campaign to clearly tell consumers what fish it was they were eating, where it was from and how it was caught or farmed. His documentary reveals Australia is part of the global contributors to the 100 million shark deaths worldwide a year and we both import and export shark fin. Not only that, but many of us unknowingly eat endangered species. Evans said it wasn’t about not eating seafood but about eating smarter and eating species such as luderick which were plentiful but under-fished. And if you’re a fan of blue fin tuna, you might think twice after Evans reveals they are caught wild as juveniles and fattened up in farms. Source news.com.au – Whats the catch? A classic example, with a little humour, we all face is the complex naming and labelling and purchasing of seafood. Names are complicated and fish names are even more so. It’s hard at the best of times to read the fine print on a food package, but in the case of the average fish-and-chip shop, good luck finding out anything much. One local shop, run for decades by a chap of English origin, used to call everything ‘cod’. Sometimes it tasted of mullet, sometimes it flaked like flathead, sometimes it was in huge chunks like mulloway. But the shop owner, when pressed, would misquote the Saint James Version of the Bible and call it ‘the piece of cod that passeth all understanding’. 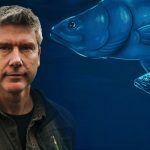 Source Northern Star – Whats the catch? Becoming a part of the solution? Fortunately there are some easy steps we can all take with the first step being to ask “Whats the Catch?” any time you purchase seafood. If you cant be told and better still shown where and when your fish was caught then don’t purchase it. Fish & Co features in the first episode when Matthew Evans looks at farmed prawns v wild sustainable prawns. At Fish & Co we have chosen to steer a very clear sustainable seafood path, like so many other small businesses, it just makes sense and is the only way we can continue to enjoy the seafood we love so much, know what we are eating and above all ensure we can do the same tomorrow and beyond. For additional updates and resources SBS has a great page setup including a lot of great information on classroom resources to work with at school. “What’s The Catch” Premieres 8.30pm Thursday 30 October. If you would like to know more about the Label my Fish campaign or contribute to the conversation please leave a comment below.